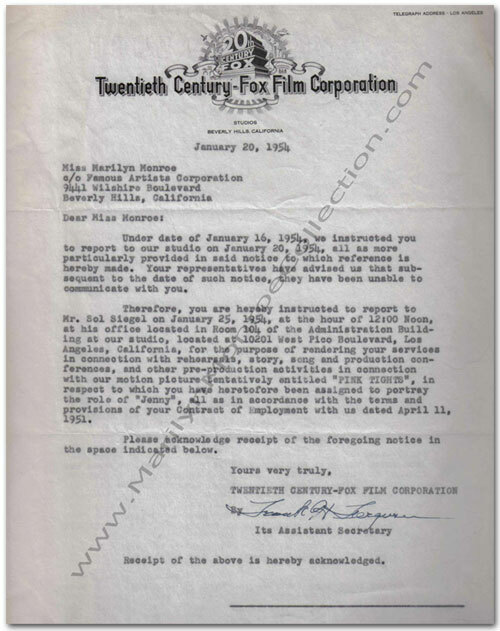 From Marilyn’s personal files, a memo from 20th Century Fox regarding an upcoming film project – The Girl in Pink Tights. The letter is signed by Frank H. Ferguson, the studio’s legal counsel. 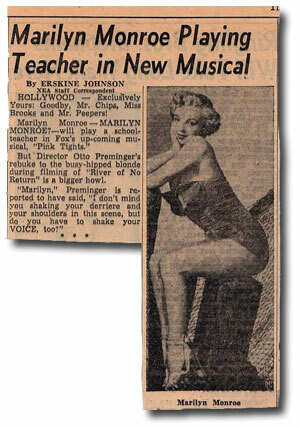 Upon completion of River of No Return in 1954, 20th Century Fox was anxious to pitch Marilyn into a new vehicle as soon as possible, a movie called The Girl in Pink Tights. Marilyn did not like the idea that co-star Frank Sinatra was set to earn $5000 a week against her $1500; even more insulting to her was Fox’s refusal to even allow her to preview the script, a reworking of the 1943 Betty Grable movie Coney Island. Marilyn went on a one-woman strike. She failed to turn up for the first day of shooting. She ignored studio threats and an official suspension. The studio told her she was being replaced by Sheree North. Marilyn blithely went up to San Francisco to spend Christmas with Joe DiMaggio. The studio sent Marilyn the script, and her worst fears were confirmed. Marilyn began 1954 by marrying DiMaggio, and was on her honeymoon when another Fox-imposed deadline passed. Marilyn Monroe by Barbara Leaming offers many details about Marilyn’s struggle with 20th Century Fox over her appearance in this film. A great read that’s highly recommended. For the first time, Marilyn succeeded in calling the studio’s bluff. Faced with losing the hottest property on celluloid, Fox recanted. They agreed to drop Pink Tights on the condition that Marilyn take a supporting role in the planned musical There’s No Business Like Show Business.